Back in the early days of the space age – the late 1950s – it seemed that the US had decided on a practical plan to conquer the frontier beyond the earth’s atmosphere. First: build a vessel that would launch on the top of a rocket but would return to the earth like a plane, gliding to a landing with its wings. Second: use the space plane to transport the materials needed to assemble a station orbiting the earth. Then, use the station to build ships that would take man to his nearest neighbor, the moon. That’s the plan laid out in the book, Space Flight: The Coming Exploration of the Universe, by Lester Del Rey (1958). Aimed at young readers, this book features illustrations by John Polgreen that originally looked futuristic, but nowadays look retro. 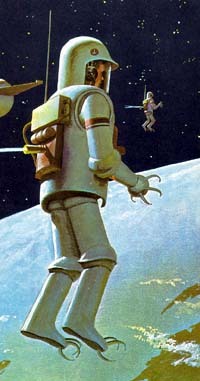 There’s something about a “spaceman” in his protective suit, floating above the earth with mechanical claws attached to his gloves and boots, that says 1950s movie sci fi. I wonder why the plan laid out in the book was abandoned. After all, the space station and the shuttle came after man landed on the moon. Was the plan impractical, too costly? Or was it because that President John F. Kennedy kicked off the space race to get the stars and stripe unfurled on the moon before the hammer & sickle? I suspect the latter. Word came down from the top: Cut to the chase; drop the shuttle and the station. With such a non-fiction book, Lester Del Rey most likely consulted with government experts. Thus the plan presented was probably the official one as of 1958. 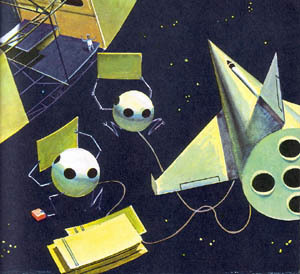 As part of the official plan, the moon ships would have been built in earth orbit using construction globes, maneuverable spheres with robot arms – and, of course, the standard claws – all operated by a man sitting comfortably in the globe. 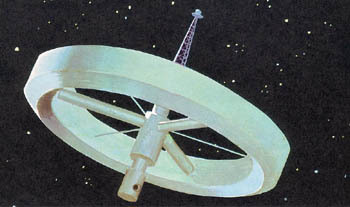 Since a moon ship didn’t have to be streamlined for the earth’s atmosphere – it would leave and return from the space station - the vessel would have a simple design, a rough frame holding together a set of fuel tanks and metal globes. Each ship would be topped by a spherical living quarters for the crew. This globe would have a couple of external antennas, radio and radar, sticking out into space, giving it that weird insect look. Three ships would go to the moon, two of them manned and the third one serving as the supply ship. 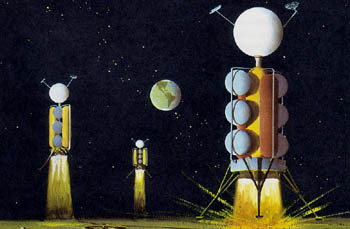 As Del Rey explains about the first lunar expedition: “About fifty men will go with the ships, since it takes many different branches of science and types of skill to explore a whole world.” He adds that since no one was sure how many trips could be made – the project would be so expensive – the astronauts had to learn as much as possible in one trip. All three ships would land on the lunar surface. Compare this proposal to the Apollo program. One ship with only three men went each time. The ship had to separate into two parts, the orbiter and the lunar excursion module. One spaceman – I mean astronaut - had to stay behind in orbit while the other two explored the surface. On the return home, the LEM had to link up with the orbiter. In Space Flight that step was eliminated: the ships took off from the moon; the only link-up to be made was with the space station. At the same time the plan in Space Flight seems to have its own potential for disaster. What would happen if the supply ship crashed? Would most of the food and water be destroyed with it? But that point is moot. The official 1958 plan is gone, down the memory hole for most people. NASA is getting ready to phase out the space shuttle for a crew exploration vehicle (CEV). Apparently NASA is going retro. The CEV will be an updated version of the space capsule atop the rocket. It won’t land like a rocket plane. And, more importantly, the CEV doesn’t even have the cool look of a metal sphere with weird insect antennae sticking out. Every Saturday night at 10 PM Eastern Time, a group of concerned Americans take to the airwaves in the 75 meter band, usually in the vicinity of 3.950 MHz, in single sideband mode. Heard primarily on the US East Coast, these amateur radio operators – hams – are politically to the right of Rush Limbaugh and the Fox News TV channel. After listening to the Liberty Net over the years, allowing their voices into my home, I’ve noted the differences in personalities, even though they repeat the same mantras about the threat of the New World Order. One of the regulars is Al Parker, hailing from Long Island. Parker has talked about the good old days of TV, the 1950s, when respectable programming was the norm. From his reminiscences, one gets the impression that he grew up during those golden years of such programs as “Have Gun, Will Travel” and “The Donna Reed Show.” He pines for those wholesome diversions, the oldtime Westerns and light-hearted family comedies. After all, black and white TV shows had black and white values, no shades of gray. Oddly enough, Parker is a science fiction fan. (Odd in the sense that most people associate SF with liberated thinking – liberalism.) Sometimes he’ll mention an old episode of “Star Trek” or “The Twilght Zone” to illustrate a point regarding the shadowy takeover of the USA by the Great Conspiracy. And then there’s his speculations. Only an SF writer sitting alone at a bar, belting down the hard stuff and letting his imagination run wild, could match Parker’s epiphanies. For example, conspiracy theorists suspect that contrails left behind by certain aircraft are laced with chemicals, so-called chemtrails. It’s part of a plan or experiment to control the masses. Parker stated that he wouldn’t be surprised if chemtrails would be used by the NWO to project holograms in the sky to frighten and control the masses through religious symbols. He was implying something on the order of a giant talking Jesus in the sky. Sometimes he’ll get on a kick about a certain aspect of the conspiracy, the Illuminati and organized crime, going on about the Illumina-Mafia. Lately he’s been anti-Albionic, blaming Britain and its Royal Family for the evil schemes unfolding throughout the world. Sometimes Parker has interesting leaps of logic. Take red symbolism, for instance. Red China loves that color and so does Britain. Look at the redcoats who fought against the colonists during the Revolutionary War. Red = royal power and communism. Parker discusses and speculates on stuff way beyond anything Donna Reed could have ever imagined. For him the world will never return to black and white TV. Looking for the perfect gift for someone you don’t really like? Are you fed up with the materialistic greed of the holiday season? Do you think Xmas is a load of dung? Then think ugation (yoo-gae-shun). It’s a word I’ve coined for a particular type of subversive art. Just hand someone one of these items as a gift and tell them it’s an ugation, an uber-genre creation (sometimes called by its less pretentious label, art wrecko). An ugation is easy to make. In fact, if you spend too much time and money on one, you’re working too hard. Just collect some items and with some glue and tape slap them together into abstract kitsch. The trick is to make it appear artsy. Think of something that could be an acceptable work, but push it too far, beyond the limits of good taste. Act like a six-year old tripping on LSD while recovering from a severe head injury. Find an empty jelly jar, fill it with marbles, and then shove a plastic flower into place. Then affix some large safety pins to the artificial petals, throw some glitter all over the mess and – viola! – you’ve ugated! Prowl through the trash can. Hey, there’s an old white lampshade. Well, grab some magic markers of various uncomplimentary colors and unleash chaos all over that shade. Then glue on some plastic bugs; you can get a bagful at your local dollar store. Now stand back – is that art or what? Now if you’re someone who feels easily guilted by giving someone a dubious gift, there’s the option of keeping the ugation and prominently displaying it in your abode. The item can sit there like an intellectual Venus flytrap, waiting for an unsuspecting bugbrain. The trickiest ugation is a simple two-item construct that supposedly says much more than the sum of its parts. For example, take a toy action figure, bobblehead, or a small plastic statue and add one thing that looks artsy. 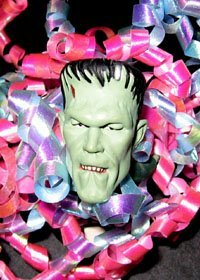 For example, I have a toy Frankenstein statue with a poseable head. By turning the head halfway around, Frank is looking up, his face at a steep angle. I found a bundle of narrow-width gift-wrap ribbon lying around and jammed it over him. This work of alleged art looks like an ET octopus is attacking Frankenstein. If anyone asks, I’ll tell him that the piece is entitled “The Monster Bound.” I’ll throw in pseudo-intellectual art critic crap about minimalism, dadaism, the existentialistic angst movement, whatever. I’ll claim that the fancy ribbon entangling Frank represents the beauty of the world trying to destroy him. Hey, is that any less BS than what you see at some galleries? In fact, ugation makes the perfect gift for someone who puts on the airs of a connoisseur. Of course, don’t tell the lucky recipient the word is really pronounced ug-a-tion – as in ugly creation. Just stick to the uber-genre story and stress the artsy u-ga-tion pronunciation. If you’re cool, the sucker – I mean recipient – won’t catch on. Like I say, art should be made by the masses – for the asses.